I am really super excited to share my projects with you guys today! 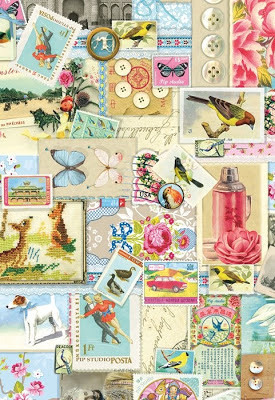 Cath over at the Moxie Fab World just posted the most beautiful Tuesday Trigger inspiration. It took all but 3 minutes for me to jump right in and start playing. So it's a little dash of extra specialness because I created an art journal page AND a card to match. I used 4 different texture and background techniques that I learned in my Donna Downey class. The base of the background is a collage of pretty patterned papers. Are these perfect summer colors or what? I want to eat it with some ice cream. So I covered the page with random pretty paper bits, then created an additional 'collage' with washi tapes. Then there are a lot of layers of white, teal, and pink acrylic paint. This little picture above shows every layer on the page. There are gesso-ed diamonds, newsprint stamps, teal paint applied with bubble wrap, yellow paint applied with cardboard, India ink, washi, paper, and word veneer. Paper - Basic Grey "Soleil", Studio Calico "Everyday Eclectic", My Mind's Eye "Up and Away", Dear Lizzy "Neapolitan". Stamps - Unity Stamp Co "Classified Newsprint", "Quiet Essence". Paints - various acrylic paints in white, yellow, teal, pink, India ink from Speedball. Inks: Memento "Teal Zeal", Distress Ink "Spun Sugar" and "Mustard Seed". Liquitex gesso, Mod Podge. Washi tapes from Recollections and Freckled Fawn. Wood Veneers from Basic Grey. I layered a lot of papers from My Mind's Eye "Up and Away" collection, which came in my Simon Says Stamp card kit (my favorite kit yet!). I used more Basic Grey wood veneers and kept them natural to off-set the super busy background. The sentiment is from Simon Says Stamp "Exchanging Friends" set. Thanks for joining me today :) I always feel a little more vulnerable sharing art pages than cards. I appreciate all the support you guys give! Happy Hump Day! What a totally perfect use of the Trigger! NICE! Very beautiful, that notebook! Beautiful colors and great technique! Great mixed media approach. I especially like the journal, but both of these are terrific takes on the Trigger. Love this - I wish I could do collage - it doesn't come naturally to me! Wow they are both so gorgeous. I really love the colors on the notebook too! Such lovely layering on the journal page and your matching card is fresh and pretty with fun dimensional embellishments. Fabulous, I love the bright cheerful colours on both the page and the card. Love those collages!! The washi on the journal page is FAB!! I wanted to play so bad. I wanted to enter my "E" with stickers, but I missed the deadline - at least I made something - it's a step closer than I have been lately.